For many players the SSE Women’s FA Cup Final is the single biggest match of the season – and Sarah Garratt says it is no different for referees. 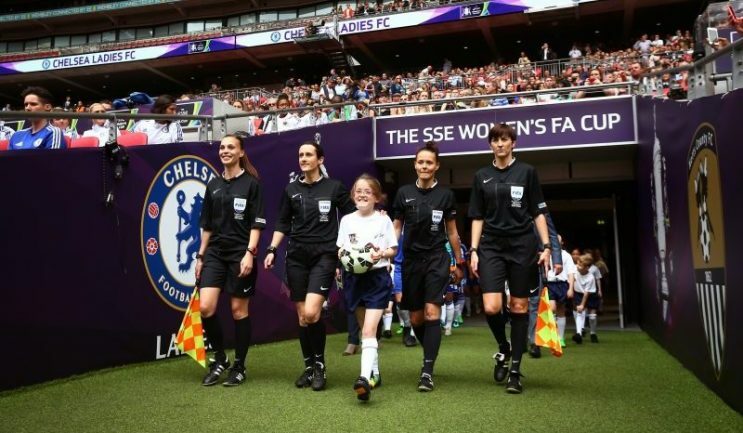 The Birmingham FA official will take charge of the Arsenal v Chelsea showpiece at Wembley Stadium on Saturday 14 May, and she said her appointment still hasn’t sunk in properly. Garratt said: “Refereeing a Cup Final is what you work your way towards throughout your career and it’s what you work hard for throughout the season, every season. “It’s the one call we all want to get and it was a big shock for me. It’s every referee’s dream to have the honour of officiating on a Cup Final. Garratt has never refereed a Women’s FA Cup Final before but she was fourth official in the 2011 Final between Arsenal and Bristol Academy at the Ricoh Arena. She said her call-up to this year’s Final, the second to be staged at Wembley, is her biggest appointment since she was named assistant referee for a League Two match at Bristol Rovers in 2014. However, despite the enormity of the occasion she is trying to stay focused on the task at hand. Garratt added: “I’ve had a bit of time to think about it and it still doesn’t feel real. I like to do some preparation before a game, and I obviously will for this one, but not too much. “But it is just another game at the end of the day and I’ll be doing no different to what I’ve done in any other game. Lisa Rashid (Birmingham FA) and Lindsey Robinson (Durham FA) have been appointed assistant referees and Lucy Oliver (Northumberland FA) will be the fourth official.